Home » THE GRAND SEIGNEUR. 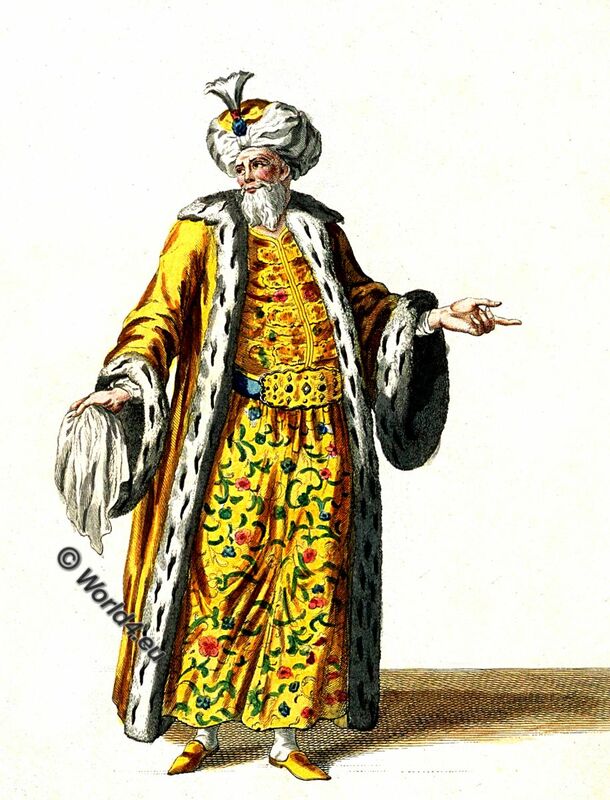 The Turkish Sultan in 1749. THIS FIGURE shows the Dress of the Grand Seigneur both in his Chamber, and when he goes to the Grand Mosque, or gives Audience: it consists of a SADAY or Vest, a KAFTAN or Robe, and a TURBAN with Three Tufts called TAILS: The Vest is of Silk and generally of a rich Brocade; this without other Covering he wears in his Chamber; when he goes to Mosque or gives Audience he puts on the KAFTAN, which is generally green or yellow, though it is sometimes Scarlet lined or at lean edged with Fur, which is either Fox Skin or Sable. He adds also the Turban with Three Tails, as a mark of State peculiar to himself. Habit of the Grand Seignior or Emperor of the Turks. Le Grand Seigneur. THE GRAND SEIGNIOR, taken from the CENT ESTAMPS of Charles de Ferriol (1652–1722), Ambassador to the PORT from the FRENCH KING Louis XIV the beginning of the present Century; consisting of 100 Dresses of the LEVANT taken on the Spot with Explanations, and printed at Paris 1715. The Figures taken from this Book are colored after a Copy which was illuminated from the original Paintings, and which was the Property of the late MARTIN FOLKES, Esquire (1690-1754, English mathematician and numismatist, and from 1741 to 1753 President of the Royal Society.). 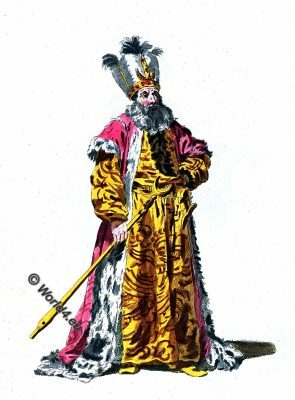 THIS FIGURE represents the Grand Seignior in a SADAY, KAFTAN, and TURBAN of a different Kind, being the DreSs which he wears abroad on ordinary OccaSions, when he goes a Hunting, or on any other Party of Pleasure . Source: A collection of the dresses of different nations, antient [i.e. ancient] and modern : paticularly old English dresses after the designs of Holbein, Vandyke, Hollar, and others: with an account of authorities, from which the figures are taken, and some short historical remarks on the subject : to which are added the habits of the principal characters on the English stage = Recueil des habillements de différentes nations, anciens et modernes, et en particulier des vieux ajustments anglois; d’après les dessins de Holbein, de Vandyke, de Hollar, et de quelques autres: avec une détail des sources & des autorités, d’où ces figures ont été prises; et quelques remarques historiques sur le sujet : auquel sont ajoutés les habits des principaux caracteres du théâtre anglois. By Thomas Jefferys, 1773.